ROWING UP, my mom would drive us to school every morning. So my brother, two sisters, and I became very familiar with the route from our house to the parish grade school. Along the way, one of the things we would pass was a Methodist Church. I remember that every year, toward the end of the school year, that Methodist Church always put a sign out on their lawn advertising their annual Strawberry Festival. I probably didn’t think anything of it at first. But, as I got to be in fourth or fifth grade, I started to think about that a bit more. I wondered why on earth anybody would hold a festival to celebrate strawberries. Why would you? It made no sense to me. I loved strawberries as much as the next kid, but I loved macaroni & cheese, too, and I never saw anybody hold a Macaroni-and-Cheese Festival. So I asked my mom about it, and she explained that strawberry festivals come from the days when you couldn’t get strawberries all year round. Strawberries are really only in season, in these parts, from about April through September. Thanks to improved technology & transportation & imports, I could go to the supermarket today—even in December—and buy a package of delicious-looking strawberries. Fresh strawberries used to be something you had to wait for, whereas you could have mac-and-cheese anytime. That’s why the festival developed: to celebrate the harvest and the return to strawberry season. I’ve never known what it is to wait for strawberry season. I’ve never known a world in which I couldn’t go to the store and buy strawberries 365 days a year (and at a 24-hour store, no less!). In fact, if I don’t want to wait in line, most stores will let me go through a “self check-out” line to speed things up. We’ve become so instant that we’ve lost the ability to wait. We make coffee in our Keurig’s, because we don’t want to wait for a pot to brew. We can’t wait to put the car in park before reading our text messages. It used to be a two-week trip to sail to Europe, but now I could be in Rome in time for dinner if I left right after breakfast. All of these advancements are good, in themselves, but they come with unintended side effects. One of those harmful side effects is that we’ve trained ourselves to reject waiting. I propose, however, that we need to rediscover the intrinsic worth of waiting. The Church has the remedy for this. In her wisdom, she gives us Advent, the season of waiting for our Lord’s coming. I’ll bet you can remember a time when you got really excited for Christmas. Certainly, when you were a young kid, you knew how to look forward gleefully to Christmas. But, what about more recently? Has the whole experience dulled a bit? Has your childish excitement ever matured into an adult excitement for Christmas—the joyful anticipation that longs to see the face of Christ? Advent is only a few short weeks, but it can be a terrific time to foster that mature excitement within our hearts. It’s not Christmastime yet; it’s Advent, and there are so many graces to be had in the stillness and the waiting. There will be a whole Christmas season, too, but we have to wait for it. That waiting is good for us. Really good waiting stretches us, and it helps us to better appreciate the thing for which we wait. If we enter into Advent in this spirit of holy waiting, we’ll end up appreciating the Christmas mystery all the more. When we make our way here for Christmas Mass, we’ll see all the candles on the wreath lit and all our decorations hung. We’ll see poinsettias & angels & the manger, but, more importantly, we’ll feel the love of the Christ Child palpably in our hearts. 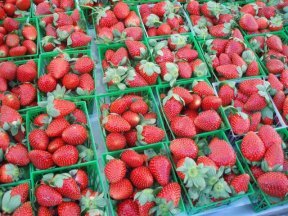 We’ll be like the folks fifty years ago who went to the strawberry festival. 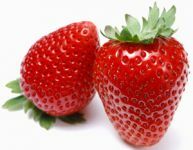 After months of waiting, they could finally sink their teeth into a rich, fresh, perfectly ripe strawberry once again. I’ll bet you my grandmother knew how to appreciate a good strawberry when their season returned. We can experience something very similar if we embrace the opportunity to wait for Christ to come. It’s almost a guarantee that, at some point in the next week, we’ll find ourselves standing in line someplace. Standing in line is something no one enjoys and something we all try to avoid. I challenge you, sometime this week, to wait in line and like it. Relish it! Instead of letting it become an occasion of sin or impatience or anger, use it as a moment of meditation. Thank Jesus for the gift of that moment, and—in a world that’s always rushing— thank Him for the opportunity simply to wait. If we can find enjoyment in standing in line, we’ll be able to appreciate the grace of Advent waiting. And if we can appreciate Advent waiting, we’ll be better able to sink our teeth into the Christmas mystery.